Another review to add to Paula Bardell-Hedley’s Wales Readathon. Chatwin’s novel of 20th century life in the Black Hills of Wales wasn’t in my TBR pile for this month, but it called to me from the pages of Anthony Bailey’s travelog, and I couldn’t resist. 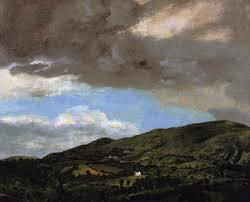 On the Black Hill (1982), 249 pp. 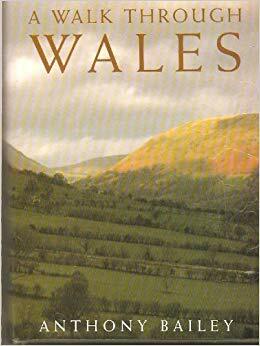 Twin brothers Benjamin and Lewis Jones, born in 1900, are the main characters in this novel, but Wales also has a starring role. In other words, this book isn’t just about Benjamin and Lewis, it’s about their world, including the land and all the oddball characters who enter, leave, and often re-enter many years later. Let’s start with the land. The twin’s parents settle on a farm on the border between Radnorshire and Herefordshire. From the crest of the nearby Black Hill, you can look westward over Wales, or eastward over England, and despite centuries of living on this border (or perhaps precisely because of it), there is heavy distrust of “the English” in the local community. 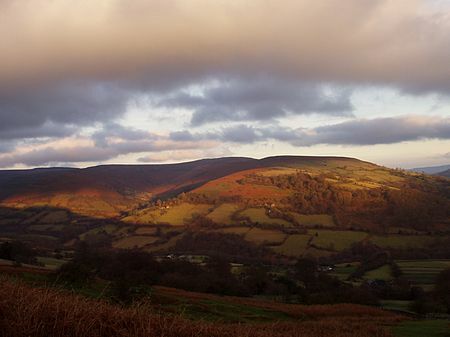 Victoria is still Queen of England when Benjamin and Lewis are born; when they turn 80, two world wars have barely touched the land around them, yet Radnorshire itself has been subsumed into the British county of Powys (“the English” at it again). The political dance doesn’t register in the lives of the Jones twins. As farmers, they see only the yearly cycles — “foddering” the livestock; mucking out sties, coops and barns; planting and harvesting, shearing and lambing — the daily toil that keeps them tied to the land, yet they never want to sever those ties. a breeze was ruffling the net curtains; a thrush sang in the pear-tree; pigeons were burbling on the roof, and patches of white light wandered over the bed-cover. Summer and autumn show their colors, sounds, and scents as well, and anyone considering the life of a farmer might want to read this. No one should be surprised to learn how hard that life is, but the rewards come in unexpected ways. For Benjamin, it’s the joy of helping a ewe during lambing. For Lewis its working the land — at first with horse and plow and then later with tractor and combine. If you’ve ever tried to follow sheep trails when hiking in any part of England, you’ve seen how they branch, veer off, rejoin, run parallel, stop suddenly, clamber down steep hills, and meander so much that you wonder why more sheep aren’t lost. Chatwin’s stories of all the people around the twins are like those sheep trails. Meg the Rock’s mother is murdered, and Meg’s placed on a neighboring farm. We see her at moments over the years — seriously ill, tending wild animals, befriending a lapsed Buddhist, attending a harvest festival. One member of a wealthy family appears at just the right moments to help Mary Jones or her sons. The twins’ sister Rebecca marries an Irishman and moves to North America; several decades later her daughter appears with hopes of inheriting the family farm. The twin’s father feuds with a neighbor, Tom Watkins, and Watkins, many years later, gets revenge at an auction, even though he has long been gone and the father long been dead. The book always comes back, however, to Benjamin and Lewis. As children, if one is hurt, the other suffers the pain. As adults, they fall ill if separated. The two grow to be different without growing apart. As adults, Lewis wants to modernize, but Benjamin hates spending the money on equipment. He’d rather buy land, even though they haven’t the manpower to take care of it. Lewis is outgoing, Benjamin shy and reluctant to leave the farm. The brothers’ only true rifts are over women (Lewis wants a wife, but Benjamin can’t tolerate the idea and sabotages all Lewis’s attempts). NB: This is a reposting of my review from 8 September 2013, updated with a few new comments and corrections after a third reading of the novel. No, not the 1970s prog-rock group (although their song, “Take the Long Way Home” may be apt for what will become obvious reasons). For this month’s Wales Readathon, Book Jotter has selected William H Davies’ Autobiography of a Super-Tramp as our shared reading. Davies’ book chronicles his years tramping around England, the US, and Canada in the 1890s — hobo campgrounds, jails, freight yards and trains, kind-hearted women and harsh railroad guards. Book Jotter will be posting weekly updates, with opportunities for others to join the conversation. It isn’t too late to participate. Head here to find out more. And if you’re interested, you can find various online (and free) editions of the book here. William Davies’ Autobiography of a Super-Tramp is the shared reading for this year’s event, so it’s a must. A Walk Through Wales, by Anthony Bailey, will be an easy add-on because it’s so short. That leaves the other three, which are hefty choices. Happy is the reader with many options! Studio of H.J. Whitlock & Sons Ltd., Birmingham, J.R.R. 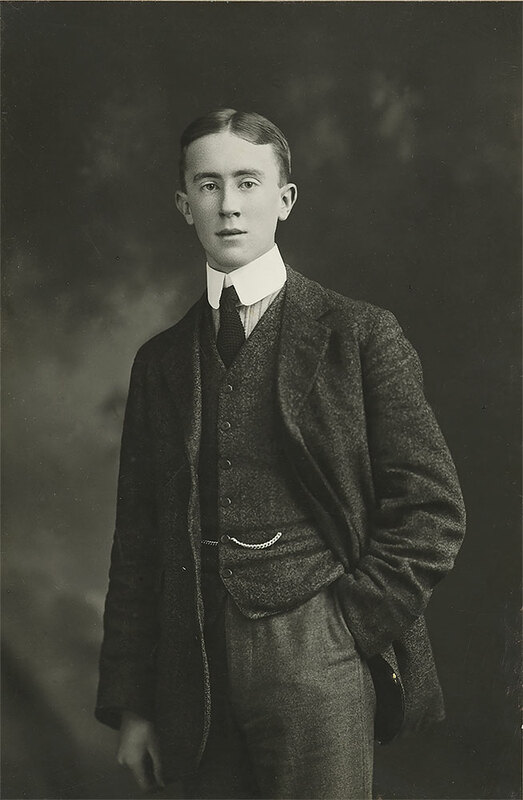 Tolkien, January 1911 [age 19], black and white photograph. Bodleian Libraries, MS. Tolkien photogr. 4, fol.16 © The Tolkien Trust 1977. The Morgan Library’s JRR Tolkien exhibit may not be large, but it’s crammed with plenty of items that require a good long look just to see every detail. Images of a small number of the items are up on the exhibit’s website, which provides a sense of the exhibit’s range: not just Tolkien’s illustrations and maps, but early versions of these, along with letters, manuscript pages, plot notes, geometric designs for heraldry, Elvish alphabetical experiments, even doodles drawn on newspaper pages as he worked the daily crossword puzzles. 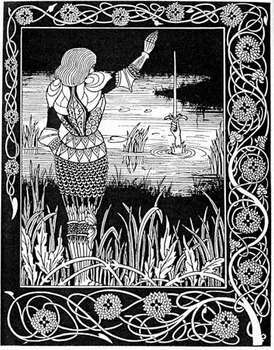 For some future post I may write an appreciation of Tolkien’s writings, but here I just want to point to Tolkien’s talent as an artist. 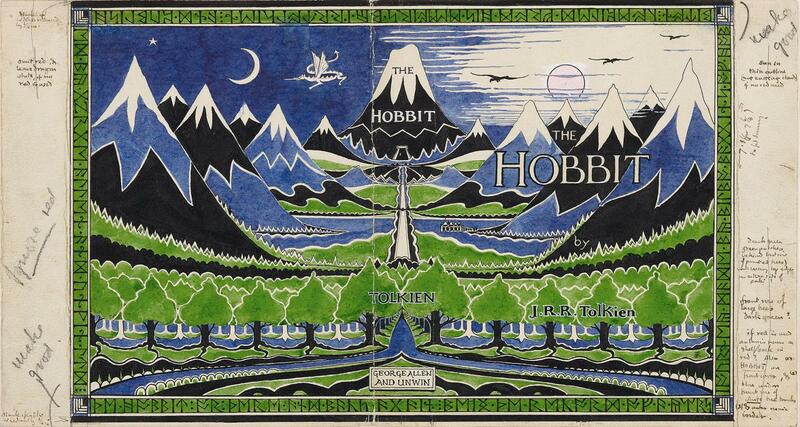 I had already seen the big pieces — full-page illustrations for The Hobbit, cover designs for LOTR, the Father Christmas letters — and of course I knew the basic story of Tolkien’s life: a WWI vet with an expertise in linguistics, he invented Elvish and then fell by accident into writing fantasy. All along, however, he was drawing — realistic scenes of the trees, rivers, and hills around him, as well as fantasy scenes that helped him envision what eventually became Middle Earth. J. R. R. Tolkien (1892–1973), Section of the first map of The Lord of the Rings, c.1937–1949, black, red and blue ink, pencil, colored pencil. 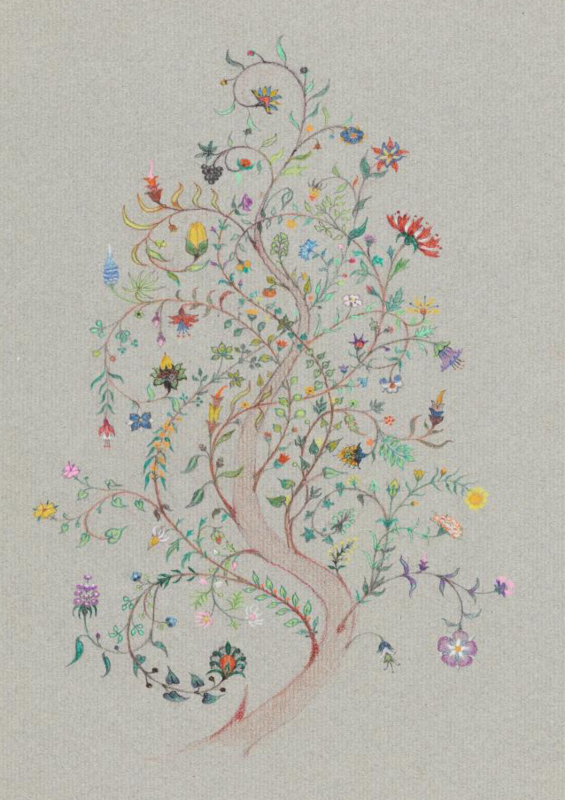 Bodleian Libraries, MS. Tolkien Drawings 103. © The Tolkien Trust 1992, 2015. The life of an author is never an easy one, and Tolkien was also a husband, devoted father of 4, academic, and founding member of the Inklings. 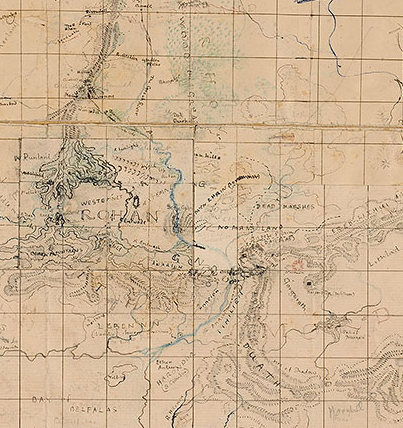 He continued to tweak his history (and maps) of Middle Earth throughout his life, and his drawing habit supported this work. If you need an additional reason to visit NYC before May 12, when the exhibit closes, this might be the final needed push. But plan your trip carefully. The best time to visit is when the Morgan opens (10:30 am), on a Tuesday, Wednesday, or Thursday (the museum is closed on Mondays). Inspired by a recent review by Calmgrove, I dug around in the archives of one of my retired blogs to find what I wrote. Here’s my take, with only a couple of minor revisions. 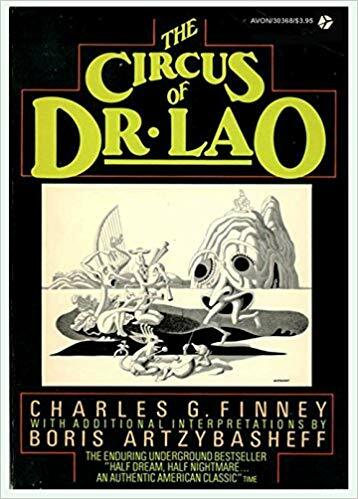 The Circus of Dr. Lao, Charles G. Finney (1935), Viking Compass, 159 pp. Happy as I am to hail from the same home town as Tony Randall, I warn you at all costs to avoid the film in which he plays Dr. Lao (the blogger behind the Great Science-Fiction and Fantasy website suggests that “if ever you are faced with possible exposure to the thing, run away screaming”). I so loved this book that, while in college, I adapted it for the stage, and a good friend offered to direct. It ran for two performances. Six months later, I received a letter from a publisher who wanted to see my adaptation, with the possibility of publishing it. In the end, they decided that producing the play would be prohibitively expensive, so they weren’t interested. My first rejection letter. Two things fascinate me about this novel. One is the odd character of Dr. Lao himself, switching between the worst parody of Chinese-influenced pidgin and perfect English throughout the book, sometimes within the same scene. He challenges everyone he meets to re-evaluate their assumptions about him and the world, and to distrust the evidence of their own senses. The other thing is the subtle humor. 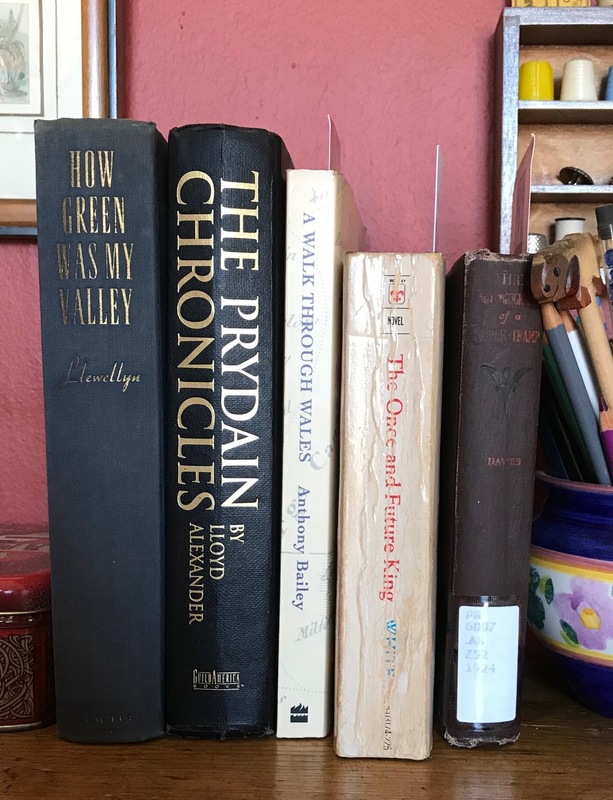 The novel takes place in a small town in Arizona, near the Mexican border (Finney lived in Tucson after leaving the army, where he served in China). Cultures collide, as European meets Asian meets Latinx. For instance, two men who have just struck up an acquaintance enter a bar. One orders “two cervezas,” and the other says, “Naw, naw, I just want beer.” Oh, the layers under that last line! Some months later I went into a restaurant and ordered pork chops. And the chops they served me–may I die this instant if I lie–were from that very pig of which I have been talking. And the moral of this story is that the whole, sole, one and only and entire purpose of that pig’s life, and the lives of its ancestors, and the lives of the things upon which pig and ancestors fed … the sole purpose of all that intermixed mass of threads and careers, I say–was to provide for me in that restaurant, at the moment I wanted them, a pair of savory pork chops. Etaoin is talking to a caged sea-serpent in this scene, who has just described eating a few Polynesians. Their conversation reveals an egocentric view of one’s purpose in life, something of which we’re all, at times, guilty. Appolonius of Tyana tells dismal fortunes, Medusa petrifies a cynical woman, a satyr nearly seduces a staid English teacher, some unidentifiable beings appear here and there, and the Grand Finale includes a scene of utter annihilation. As Calmgrove points out, Finney created scenes of racism and bigotry, not to mention misogynistic objectification of women. The Great Depression, though in full-swing by the publication date, gets no attention at all. The issue of what to make of books and authors whose sensibilities don’t match 21st century social justice ideals is one I’m not prepared to address in this post. For now I’ll just say that, however imperfect this fantasy is, it’s still a perceptive tale of human foibles and well worth reading.